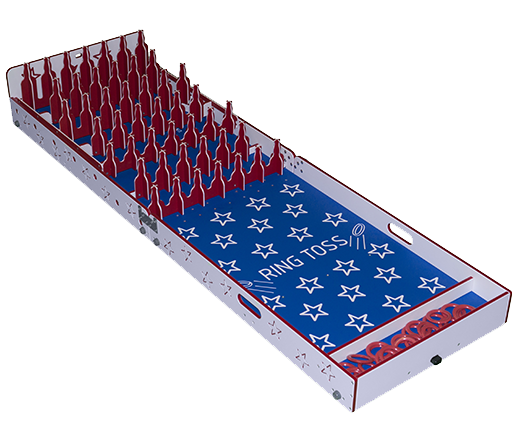 This is an updated version of the traditional Coca Cola bottle and ring toss carnival game -- but, instead of using breakable glass bottles, this game uses non-breakable plastic bottle-shaped figures with great red-white-and-blue graphic colors. 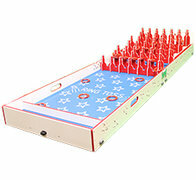 The Bottle Toss carnival game is easy to play for all ages. Each player is given five rings to try their hand at "Ringing" one of the individual bottle figures so that the ring lies securely on the neck of the bottle. To adjust the difficulty of the game, just have the players stand closer or further away from the bottles. One fun option is for winners to actually get a bottled beverage or to select from various prizes base don whether they were successful with one, two, three, four or even five of their tosses being "ringers"! But, of course, no prizes are necessary as the kids will have fun with just the challenge of getting a ringer and beating their friends! For an even more dramatic effect and better look, add one of our carnival tents to make you event stand out even more.